The intent of this project was to use a tidbit of info that I received from a site visitor that sparked my imagination and could make use of things I had laying around the house to set up a type of hydroponic gardening using recycled materials. In order to have some points of reference to see if this new method was valid or not I set up the same seeds using two other types of starting plants. My seeds are all on the old side, but they had good sprout rates last year.. and they are what I have in the house. I choose three types of seed that are large enough to see and handle easily that would also provide an edible crop if successful. 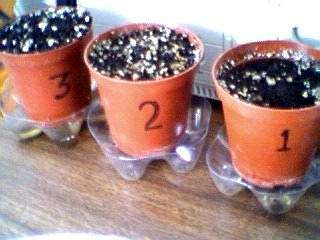 I also started six of each seed on damp paper towel and in a bottle cap with water to plump. The paper towel is labeled and it and the bottle caps are on a glass plate covered in plastic wrap to hold moisture. Soaking seeds are rinsed daily and given clean water. 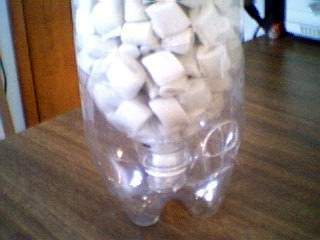 I chose to use packing peanuts as the growing medium, breaking the pieces in half, and Pop Bottle Pots as the container. I'll hand pour and use the reservoir as the catch basin. Two items that are GOOD to recycle. Seeds are started in three popular methods. The seed started in the soil will be my 'control' group. As they sprout I will thin to the strongest two seeds per pot. Later I will thin to strongest one. 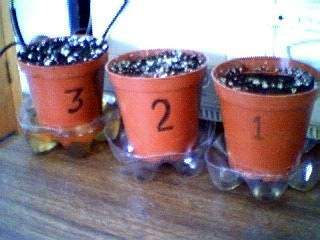 As for the other two sets of seeds.. the strongest sprouters with be the ones introduced to the peanut filled bottle pots. My plan is to have three plants per pot. That would be about the same growing space that plants would have if placed in a square foot garden.. I have had good results growing all three of these varieties in soil filled Pop Bottle Pots in the past. The left shot of each pair are the seeds that were started on damp toweling.. the pic on the right in each pair are the seeds that were soaked for the first three days. I was rather surprised to see that the seeds that were soaked and had plumped much quicker (showing uptake of water was quicker) were not the first to sprout. I suspect that since none of the limas have sprouted that the seeds may no longer be viable. All three varieties are from seed packets dated 1998 so it is possible that they are dead. I will wait a few more days before tossing them. 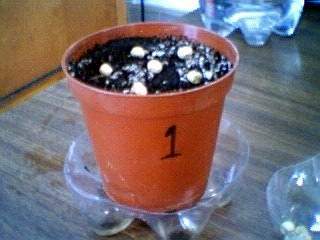 With four seeds sprouted for both the beans and the peas I decided to place three seeds to grow in the center of each pot and set the extra fourth one on the edge so that I could watch the growth progress. I still don't know if this method of hydro with this medium will work.. so this way I will be able to see if the seeds are growing, become diseased or die. does shift them. I found that to be interesting. position on the edge of soil pot number 1. That pot has been moved to a window sill. The soaked limas and soaked peas have died.. I've tossed them.. I think I soaked them too long, I usually only do it for 24 hours.. but didn't follow my routine and they were in water for 72. I'd like to test that part again. The seeds that were on the damp towel: All the beans and peas have sprouted - 100 percent germination out of 6 year old seed. The Limas started sprouting. Had four of them ready for the hydroponics pop bottle pot.. 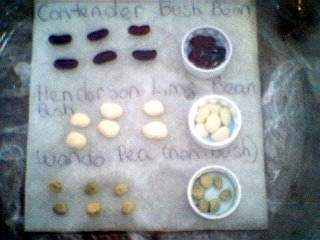 So.. on the left is the bean, center is the pea and the one on the right is the lima. In the soil pots, control group.. a second pea plant as broken the soil surface. I've been hand watering these roughly every four or five hours.. as I think of it... in the morning when I first get in the office.. around 11ish.. pictures are taken around noon.. and then a watering in the evening sometime.. then before going to bed. The water is dumped out of the reservoir into a container and poured over the top.. 4 or 5 times each time.. allowing the water to remain in the reservoir until next time. So far. 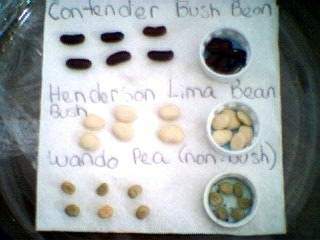 18 seeds were sprouted on moist paper towel.. all sprouted except two limas. 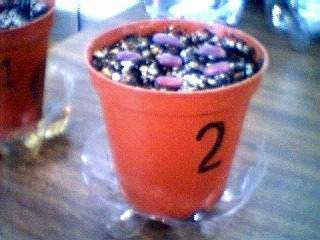 18 seeds were started in conventional soil pots. 2 Peas and 1 bean are up. 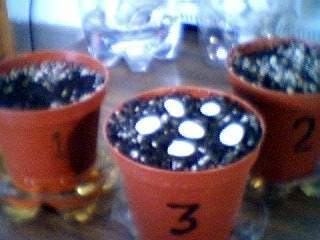 4 of each seed are in hydro pots, none have broken the surface yet. Conclusions: Well.. I'm gonna say it was a flub. From what I've been reading the last couple of days the problem lies in the packing peanuts not being able to hold water between 'pourings'. It's acts much as perlite. I'm gonna take a leap here and suggest to anyone that wants to try recycling packing peanuts to use as a planting medium treat them as you would perlite and add vermiculite as the moisture holder and the packing peanuts as the mix lightener/aerator. I may run this experiment again, doing just that.. but first I'd have to pick up the vermiculite... 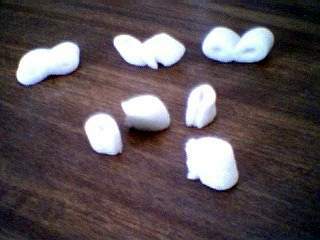 I may also try it using half potting soil half chopped packing peanuts. 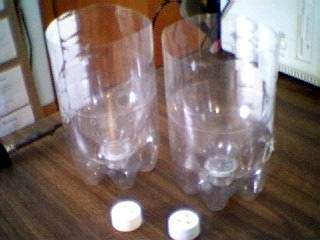 My point in doing this was to find a practical use for something that isn't otherwise recyclable, other than having it laying around until you have another package to ship.